Even though malaria is preventable and curable, it has become a serious threat to mankind. In 2016, there were an estimated 216 million cases of malaria across the world. The biology of its causative agent, i.e. Plasmodium parasite is full of complex mechanisms. There are five Plasmodium species responsible for malaria in humans, viz. Plasmodium falciparum, P. vivax, P. malariae, P. ovale and recently identified P. knowlesi that normally infect apes. In humans, malaria is spread by the injection of Plasmodium sporozoites through the bite of infectious Anopheles’ female mosquito during their blood meal. From the time of entry into human skin till the development into the asexual forms, the parasite undergoes several transformations. This review attempts to understand the science behind the pre-erythrocytic liver stage of Plasmodium. Research articles explaining parasite biology, cell-traversal, transformation stages, cell-egress process, etc. were retrieved from PubMed and google scholar database. Various known and unknown mechanisms and strategies used by the malaria parasite P. berghei in rodent models have been discussed in this review. Limited or no information was available for humans, due to technical feasibility and complexity of parasite’s life cycle. Hence, it was concluded that there is an urgent need to investigate the hepatic invasion, traversal and egress mechanism of P. falciparum and P. vivax for developing novel therapeutics to fight against malaria. In 2016, there were an estimated 216 million cases of malaria across the world, which included around 445,000 deaths,. This was an increase of about five million cases and 16000 deaths over the previous year, respectively. Malaria remains an unconquered disease of tropical and subtropical regions which is caused by a protozoan parasite called Plasmodium, a member of phylum Apicomplexa. One or more Plasmodium spp sporozoites (spz) are responsible for the infection (malaria). Plasmodium spp voyage in human host begins when several Spz enters the human skin through the mosquito’s (infected female Anopheles spp) saliva, while drawing blood meal (mosquito bite). Subsequently, spz reaches to blood vessels and travel passively to various body parts including liver, where spz develop and transforms into merozoites, an infectious form for red blood cells. Extensive literature survey was done by accessing NCBI-PubMed and google scholar, and research articles discussing pre-erythrocytic stage in rodent and human Plasmodium spp were selected to extract significant information. Subsequently, a hypothesis was developed by connecting the points from various studies, which is discussed in this review. Plasmodium spp belongs to the Plasmodiidae family. In the course of evolution, parasite might have developed with unique cellular organelles such as microneme, rhoptory and apicoplast, enclosed by an apical polar ring. These organelles are necessary, to infiltrate host cells, spz motility and development of the non-phago-somal parasitophorous vacuole (PV) inside the host cell. Microneme and rhoptories acts as reservoir for secretory proteins and phospholipids. They also assist spz to establish in host to develop as more infectious form for clinical manifestations. For survival, spz switches between vertebrate and invertebrate hosts, by operating various molecular machineries, which helps the parasite in finding a suitable microenvironment to continue their replication and progeny in two different hosts. In human host, spz journey goes through a life-threatening period where they escape from immune responses; and to overcome with such obstacles, spz use different mechanisms like, unique gliding motility, hepatocyte invasion and cell traversal, replication into multiple infectious form for erythrocytic stage, or hibernate into a dormant forms, and production of male and female gametocytes. Plasmodium’s entry, persistence and exit from liver cells are an essential part of the parasite’s development biology, before proceeding for the erythrocytic stage,,. There are several unknown factors that might have significant role to establish the parasite in the liver and continue to code and decode its mysterious events in their DNA database for its progeny. If, some of the factors can be identified and studied in detail, they might provide answers to understand the parasite biology (mode of action inside and outside of the host cells) and open doors for new therapeutic developments. This brief review emphasizes on different aspects of the pre-erythrocytic stages of spz [Figure 1] including the liver stage, which is one of the most crucial part of the Plasmodium’s fate in humans. The following sections includes discussion on spz, cell traversal through epidermal cells, hepatocyte invasion and gaps in understanding the liver stage biology of parasite. 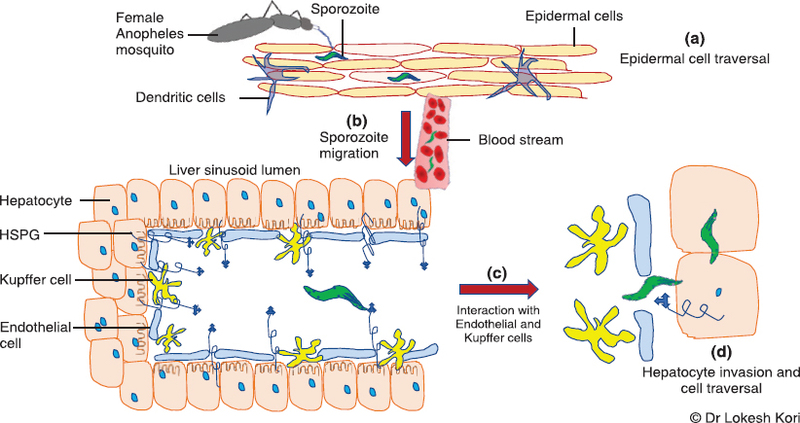 Figure 1: Schematic representation of pre-erythrocytic stages of sporo-zoite—(a) Entry of spz in skin tissues through mosquito bite, followed by epidermal cell traversal to enter blood vessels; (b) Spz succeeds to liver sinusoid lumen through blood ves-sels by gliding motility; (c) Escape of spz from endothelial and Kupffer cells; and (d) Spz invades to hepatocytes and traverses in neighbouring cells by using various molecular approaches. In mosquito, a diploid zygote is formed after fertilization of male and female gametocytes. Sequentially, zygote transforms into motile and invasive ookinete that undergoes various developmental changes and traverses through midgut epithelial cells and transforms into oocyst. These oocysts later develop as sporoblasts from which spz buds out and matures in salivary glands of mosquito. Development of 3D cryoelectron microscopy has aided our understanding on architecture of spz. Physically, spz are 10–15μm long and ~1 μm in diam with slight curve slender cells. They are fast runner and use gliding motility (at high speed of ~ 1–2 μΜ/sec) in the first 30 min to pierce the epithelial cell membrane during cell traverse. Often, they use actin-myosin motor for gliding motility along with flexing, twisting and turning motions; for capping of parasite surface molecule and to invade the host cell. Adhesion dynamics studies have revealed the mechanism behind fast spz motility using reflection interference contrast microscopy (RICM). The reason behind the fast motility in spz is the detachment and re-attachment of distinct adhesion sites based on the actin dynamics and the surface protein thrombospondin-related anonymous protein (TRAP). Skin cells play a central role in guarding the host’s internal organs from external infectious agents. Spz are injected in skin connective tissues rather than in hosts blood vessels as shown in recent findings. In humans, Anopheles stephensi mosquito release about 10–100 spz per blood meal, with the rate of~1-2.5 per second, as measured in P. berghei mice models. For the development of spz into merozoites (infectious form for red blood cells), parasites translocate them in liver by invading hepatocyte through sinusoidal space. Spz takes about 2–2.3 h to reach the sinusoid space from epidermal cells after mosquito bite. During the process of dermal cell traversal spz remain at the site of a mosquito bite in the human skin for at least 30 min, subsequently majority of spz leave the site either by blood vessel (70%) or lymphatic system (30%). Later, dermal fibroblast comes in action and clears the weak, traversal deficient or dead spz from the host by dendritic cells during and after the escape from immune cells by traversing them. During cell traversal and migration to hepatocytes, SPECT 1 (sporozoite protein essential for cell traversal) and SPECT 2 (perforin like protein 1 or PLP1) proteins plays key roles. Sporozoites have evolved with an array of molecular mechanisms for a successful escape from host immune system and progressive survival in their host,,,,. Bhanot et al in 2005, reported that spz traverse through skin epidermal cells to get access in the blood vessel, in P. berghei rodent model; they had discovered that spz secrete a surface phospholipase enzyme, which is highly conserved throughout Plasmodium species and is also involved in the migration of spz through epidermal cell traversal. Although, the exact mechanism used by Plasmodium spp to invade the cell membrane of the host cell is not exactly known. After leaving the dermis and perceptively escaping from the host immune system, spz moves towards the liver through hepatic arteries and arterioles and reaches to sinusoid cavity, where they adhere to endothelial cells before proceeding to invade the hepatocytes. To get access in the livers cells, spz uses different approaches; they enter either through the space between the discontinuous endothelial cells or migrate through endothelial cells or traverse through the Kupffer cells by rupturing the plasma membrane. Subsequently, these events are followed by formation of nonfusogenic parasitophorous vacuole and transcytosis into hepatocyte,,. Interestingly, based on results from the experiments performed on P. berghei and P. yoelii spz, it was postulated that Kupffer cells are the preferred target sites to get access in hepatocytes,. Spz use cell traverse approach to protect themselves from getting cleared by Kupffer cells in sinusoid space before reaching to hepatocyte. In [Figure 2], a summary of potential interaction has been shown, where Plasmodium spz secretes microneme or rhoptory proteins for Kupffer cell lysis, and escape from gaps between endothelial cells and hepatic invasion. The purpose behind spz drive to reach sinusoid lumen is to develop into the erythrocytic infectious form or to go in a dormant stage. During development and maturation, spz might programme themselves to survive on their own, until they find a suitable microcellular environment to propagate into new self-regenerative forms. Figure 2: An overview of possible interaction between Plasmodium spz with Kupffer cells, endothelial cells and hepatocytes—(a) Spz prefer Kupffer cells as gateway to exit from sinusoid space and invade hepatocyte; and (b) Spz may use one more strategy through which they can pass through the gaps be-tween discontinuous endothelial cells to invade hepatic cells. Sporozoites encounter with endothelial and Kupffer cells In vitro studies suggest that spz do not invade sinusoidal endothelial cells but attacks Kupffer cells, and while keeping themselves stabilized with circumsporozoite protein-heparan sulfate proteoglycan (CSP-HSPG) interaction, they form a nonfusogenic parasitophorous or transient vacuole inside the Kupffer cells. This strategy protect spz from being degraded by phagocytosis to continue the journey of a successful entry in hepatocytes. Heparan sulfate proteoglycan (HSPG) protrudes from hepatocytes into the sinusoid lumen through fenestrated endothelial cells,. HSPG act as receptors for CSPs which are present on the surface of sporozoites and signals the parasite to invade hepatocyte productively. Recent findings suggest that P39 and CD38 macromolecules are also involved during the invasion process,,. This may be one of the possible reasons why spz migrate from low sulfated skin region and endothelial cells to highly sulfated liver cells. For stability of sporozoite in sinusoid, the CSP anchor binds with glycosaminoglycan chains (GAG’s, found only in liver) of HSPG in the perisinusoidal space (space of Disse).This interaction is rapid and highly specific, however during cell invasion heparin does not show significant effect. In P. berghei CSP constitute 5-15% of total spz protein and is crucial during the formation of sporozoite in midgut of mosquito, followed by release of sporozoites from oocyst and maturation in salivary glands. CSPs are the necessary dominant macromolecules actively involved in hepatic invasion,,,,,,. Evidences have shown that sporozoite stage of many apicomplexan parasites have a common property of cell traversal, though this is still not clearly known why cell traversal is necessary before development of infectious stage of sporozoite. Cell traversal deficient spz are not able to walk through the dermal and hepatic cells,,,. Based on different experimental approaches, few models have been proposed that clears the picture of spz cell traversal in hepatocytes. In the first concept, during the apical exocytosis high intracellular calcium (Ca2+) increases hepatocyte infection, while high intracellular potassium (K2+) increases hepatocyte invasion and decreases cell traversal activity, simultaneously. Elevated concentration of K2+ could be inhibiting the secretion of microneme proteins, whereas low concentration of K2+ could be triggering the microneme secretion,. Second concept suggests, that due to cell traversal hepatocytes may secretes extracellular micro-factors to facilitate spz to infect the neighboring cells. The third concept suggests, that the spz sense their micro-environment and respond accordingly by switching off the mechanism for cell traversal and invasion. For example, spz with in low HSPG may enhance cell traversal activity whereas cells with high HSPG enhances the cell invasion activity. It has been established in recent years that P. yoelii spz take about 30–60 min to switch between cell traversal and cell invasion in hepatocytes. The key to most of the questions behind the hepatic cell invasion and traversal lies with the structural and functional properties and mechanisms of proteins secreted by microneme and rhoptory. These cell organelles play significant role during the liver stage proliferation of spz. 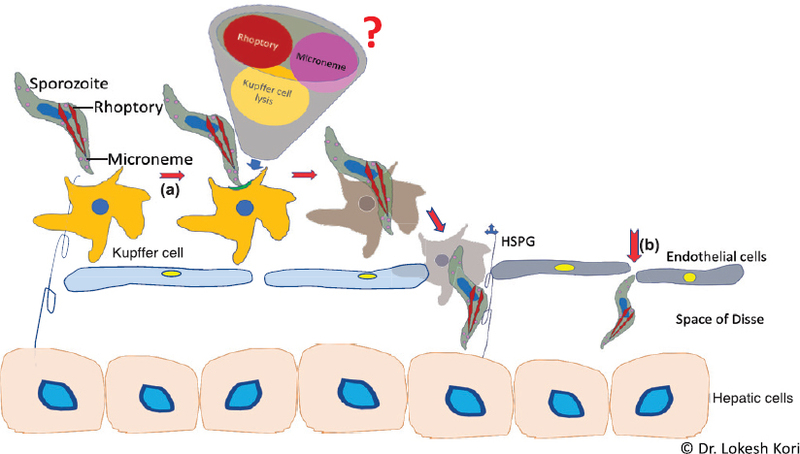 Most of the basic research done so far well connects the loose points in the early liver stage cell traversal, invasion and infection of Plasmodium. The majority of the works have been performed on P. berghei. Further, research on P. falciparum and P. vivax need to be planned by following the leads from rodent malaria parasite models. The findings might help us to understand the parasite biology in detail by knowing the mechanism behind hepatic cell invasion and traversal, through investigating macromolecules involved in Kupffer cell traversal and hepatic cell membrane remodeling. Also, it will provide with potential targets to design and develop new antimalarial molecules or potential vaccine candidates for therapeutics. The authors are grateful to the Director, ICMR–National Institute of Malaria Research, Dwarka, New Delhi for providing the necessary support facilities. World Malaria Report 2016. Geneva: World Health Organization. Available from: www.who.int/malaria/publications/world- malaria-report-2016/report/en/ (Accessed on April 14, 2017). Menard R, Taraves J, Cockburn I, Markus M, Zavala F, Amino R. Looking under the skin: The first steps in malaria infection and immunity. Nat Rev Microbiol 2013; 11(10): 701-12. Niz MD, Burda PC, Kaiser G, Portillo HA, Spielmann T, Frisknecht F, et al. Progress in imaging methods: Insights gained in Plasmodium biology. Nat Rev Microbiol 2016; 15(1): 37-54. Kappe SH, Buscaglia CA, Nussenzweig V. Plasmodium sporo- zoite molecular cell biology. Ann Rev Cell Dev Biol 2004; 20: 29-59. Ishino T, Yano K, Chinzei, Y, Yuda M. Cell-passage activity is required for the malarial parasite to cross the liver sinusoidal cell layer. PLoS Biol 2004; 2(1): 77-84. Gonsalves LA, Rodo J, Duarte LR, Moraes LV, Gonsalves CP. HGF secreted by activated Kupffer cells induces apoptosis of Plasmodium-infected hepatocytes. Front Immunol 2017; 8: 90. Yang AS, Boddey Justin A. Molecular mechanisms of host cell traversal by malaria sporozoites. Int J Parasitol 2017; 47(2–3): 129-36. Munter S, Sabass B, Unkel CS, Kudryashev M, Hegge S, Engel U, et al. Plasmodium sporozoite motility is modulated by the turnover of discrete adhesion sites. Cell Host Microbe 2009; 6(6): 551-62. Douglas RG, Rogerrio A, Sinnis P, Frischknecht F. Active migration and passive transport of malaria parasite. Trends Parasi- tol 2015; 31(8): 357-62. Sinnis P, Coppi A. A long and winding road: The Plasmodium sporozoite’s journey in the mammalian host. Parasitol Int 2007; 56(3): 171-8. Amino R, Thiberge S, Martin B, Celli S, Shorte S, Frischknecht F, et al. Quantitative imaging of Plasmodium transmission from mosquito to mammal. Nat Med 2006; 12(2): 220-4. Amino R, Giovannini D, Thiberge S, Gueiard P, Boisson B, Dubremetz JF, et al. Host cell traversal is important for progression of the malaria parasite through the dermis to the liver. Cell Host Microb 2008; 3(2): 88-96. Patarroyo ME, Alba MP, Curtidor H. Biological and structural characteristics of the binding peptides from the sporozoite proteins essential for cell traversal (SPECT)-1 and -2. Peptides 2011; 32(1): 154-60. Wilson KL Xiang SD, Plebanski M. A model to study the impact of polymorphism driven liver-stage immune evasion by malaria parasites, to help design effective cross-reactive vaccines. Front Microbiol 2016; 7: 303. Gomes P, Bhardwaj J, Rivera Correa J, Freire-De-Limma CG, Morrot A. Immune escape strategies of malaria parasites. Front Microbiol 2016; 7: 1617. Bhanot P, Schauer K, Coppens I, Nussenzweig, V. A surface phospholipase is involved in the migration of Plasmodium spo- rozoite through cells. J Biol Chem 2005; 280(8): 6752-60. Meis JF, Verhave JP, Jap PH, Meuwissen JH. An ultrastructural study on the role of Kupffer cells in the process of infection by Plasmodium berghei sporozoites in rats. Parasitology 1983; 86(2): 231-42. Pradel G, Fravert U. Malaria sporozoites actively enter and pass through rat Kupffer cells prior to hepatocyte invasion. Hepatology 2001; 33(5): 1154-65. Frevert U, Engelmann S, Zougbede S, Stange J, Ng B, Matuschewski K, et al. Intravital observations of Plasmodium berghei sporozoite infection of the liver. PLoS Biol 2005; 3(6): e192. Tavares J, Formaglio P, Thiberge S, Mordelet E, Rooijen NV, Medvinsky A, et al. Role of host cell traversal by the malaria sporozoite during liver infection. J Exp Med 2013; 210(5): 905-15. Risco-Castillo V, Topcu S, Marinach C, Manzoni G, Bigorgne AE, Briquest S, et al. Malaria sporozoites traverse host cells within transient vacuoles. Cell Host Microbe 2015; 18(5): 593-603. Prudencio M, Rodriguez A , Mota MM. The silent path to thousands of merozoites: The Plasmodium liver stage. Nat Rev Microbiol 2006; 4(11): 849-56. Coppi A, Natarajan R, Pradel G, Bennett BL, James ER, Roggera MA, et al. The malaria circumsporozoite protein has two functional domains, each with distinct roles as sporozoites journey from mosquito to mammalian host. J Exp Med 2011; 208(2): 341-56. Frevert U, Sinnis P, Cerami C, Shreffler W, Takacs B, Nussenzweig V. Malaria circumsporozoite protein binds to heparan sulfate proteoglycans associated with the surface membrane of hepatocytes. J Exp Med 1993; 177(5): 1287-98. Rathore D, Sacci JB, Vega P, McCutchan TF. Binding and invasion of liver cells by Plasmodium falciparum sporozoites. essential invovlement of the amino terminus of circumsporozoite protein. J Biol Chem 2002; 277(9): 7092-8. Cha SJ, Srinivasan PK, Schindler CW, Rooijen NV, Stins M, Lorena MJ. CD68 acts as a major gateway for malaria sporozoite liver infection. J Exp Med 2015; 212(9): 1391-403. Coppi A, Tiwari R, Bishop JR, Bennett BL, Lawrence R, Esko JD, et al. Heparan sulfate proteoglycans provide a signal to Plasmodium sporozoites to stop migrating and productively invade cells. Cell Host Microb 2007; 2(5): 316-27. Pinzon-Ortiz C1, Friedman J, Esko J, Sinnis P. The binding of the circumsporozoite protein to cell surface heparan sulfate proteoglycans is required for Plasmodium sporozoite attachment to target cells. J Biol Chem 2001; 276(29): 26784-91. Yoshida N, Potocnjak P, Nussenzweig V, Nussenzweig RS. Biosynthesis of Pb44, the protective antigen of sporozoites of Plasmodium berghei. J Exp Med 1981; 154(4): 1225-36. Menard R, Sultan A, Cortes C, Altszuler R, van Dijk MR, Janse CJ, et al. Circumsporozoite protein is required for development of malaria sporozoites in mosquitoes. Nature 1997; 385 (6614): 336-40. Thathy V, Fujioka H, Gantt S, Nussenzweig R, Nussenzweig V, Menard R. Levels of circumsporozoite protein in the Plasmodium oocyst determine sporozoite morphology. EMBO J 2002; 21(7): 1586-96. Wang Q, Fujioka H, Nussenzweig V. Exit of Plasmodium sporozoites from oocysts is an active process that involves the circumsporozoite protein. PLoSPathog 2005; 1: e9. Tewari R, Roberta Spaccapelo, Bistoni F, Holder AA, Crisanti A. Function of region I and II adhesive motifs of Plasmodium falciparum circumsporozoite protein in sporozoite motility and infectivity. J Biol Chem 2002; 277(49): 47613-21. Kojin BB, Costa-da-Silva AL, Maciel C, Henriques DA, Carvalho DO, Martin K, et al. Endogenously-expressed NH2- terminus of circumsporozoite protein interferes with sporozoite invasion of mosquito salivary glands. Malar J 2016; 15(1): 153. Mota M, Pradel G, Vanderberg JP, Hafalla JCR, Frevert Y, Nussenzweig RS, et al. Migration of Plasmodium sporozoites through cells before infection. Science 2001; 291(5501): 141-4. Yuda M. Liver invasion by malarial parasites—How do malarial parasites break through the host barrier? Cell Microbiol 2004; 6(12): 1119-25. Formaglio PT, Menard R, Amino R. Loss of host cell plasma membrane integrity following cell traversal by Plasmodium sporozoites in the skin. Parasitol Int 2014; 63(1): 237-44. Moudy R, Manning TJ, Beckers CJ. The loss of cytoplasmic potassium upon host cell breakdown triggers egress of Toxoplasma gondii. J Biol Chem 2001; 276 (44): 41492-501. Kumar KA, Gracia CR, Chandran VR, Rooijen NV, Zhou Y, Winzeler E, et al. Exposure of Plasmodium sporozoites to the intracellular concentration of potassium enhances infectivity and reduces cell passage activity. Mol Biochem Parasitol 2007; 156(1): 32-40. Carrolo M, Giordano S, Santos LC, Corso S, Viagrio AM, Mota MM. Hepatocyte growth factor and its receptor are required for malaria infection. Nat Med 2003; 9(11): 1363-9.